Jaw-dropping mountain ranges, majestic fiordlands, active volcanoes, and rolling pastures—there’s really not much that New Zealand doesn’t have. The small country in the South Pacific Ocean really lucked out when it came to handing out the good looks, and the result is a country with awe-inspiring scenery around every corner. This wild, rugged beauty has long been a favourite on the holiday destination list, with visitors flocking to get their fill of fresh air, photo opportunities, and a taste of the famous laid back Kiwi lifestyle. There’s something for every kind of holiday maker here, with vibrant cities, wine tours, and adventure sports galore. However there’s one way of visiting this country that blows all others out of the water, and that’s by doing a tour in a campervan. Thanks to its size, you can tour the whole country in a matter of weeks, talking in the diverse geography of both the North and South Islands. The country is also gloriously remote, so you’ll find many occasions when you are the only vehicle in sight. Combine this with friendly locals, delicious food, and the chance to sleep under some of the brightest stars you’ll ever see, and you have all the reasons you need to book yourself a campervan in New Zealand. There are many different car, motorhome, and campervan rental operators working in New Zealand, giving visitors a great deal of choice in terms of size, features, and model. The best way to make sure you find the best vehicle for the cheapest price is to book through an unbiased comparison site like DriveNow. With more than 16 years of experience in comparing and booking campers, DriveNow will help you find the lowest price from the widest selection of New Zealand campervan hire companies including Britz, Maui, Jucy, Lucky, Mighty, Tui Campers, Travellers Autobarn, and Freedom Campers among many others. The cost of your rental will vary depending upon vehicle size, supplier and time of year with pricing from as low as $30 a day for a 2 berth Camper during the off-peak season. Whether you want to cruise the country in a budget campervan or do some serious adventuring in a 4X4, make sure you head to DriveNow for simple, fast and reliable booking. That way you’ll free up more of your time for planning your route, packing your suitcase, and getting excited. When it comes to packing in things to see and do, New Zealand doesn’t mess around. No matter where you travel in the country, you’ll never be too far away from a stunning natural work of art; whether that’s a famous glacier, a sizzling volcano, or a pristine white beach. So much so, that listing every famous scenic spot to check out in New Zealand would be impossible! There are, however, some truly remarkable areas from each region of the country that definitely deserve a spot on your hit list. Here are just a few of these to try and pack into your camper holiday planning. The Bay of Islands is one of New Zealand’s most popular holiday destinations, and a perfect place to take your campervan rental. The band of more than 140 small sub-tropical islands is situated on the shores of Paihia, just three hours’ drive from Auckland, and makes up one of the most picturesque spots in the country. Boasting the ‘second bluest sky in the world’ after Rio de Janiero, you’ll also find bright white beaches, lush green forests, and stunning turquoise waters. As if the beauty of this place alone wasn’t enough, there is a huge variety of things to do here, from dolphin spotting to hiking to scuba diving. Otago is home to New Zealand’s biggest and most popular adventure towns, making it one of the most regularly visited areas in the country. Queenstown and Wanaka have both boomed in the recent decades, with developers making the most of the outstanding scenery to create a base for every adventure sport imaginable. The area is an adventure lover’s dream all year round, with hot summers for hiking or water sports and cold, snowy winters perfect for the nearby ski fields. Although pricier than some other parts of the country, once you’ve visited Otago, you’ll know what all the fuss is about. New Zealand is host to some pretty spectacular geothermal activity, and the perfect place to witness this is Rotorua. This small town is located on the Taupo Volcanic Zone, a rare part of the world where volcanic lakes, mud pools, and hot spouting geysers are a regular part of the landscape. The area is also famous for its Maori culture and history, and is home to a functioning Maori village as well as the New Zealand Maori Arts and Crafts Institute. A trip to Rotorua in your NZ campervan hire could involve bathing in thermal springs, taking a guided tour of the geothermal parks, or exploring by bike, kayak, or on foot. One of the most unique and exciting features of a trip to NZ is the chance to get up close to glaciers. New Zealand is home to some of the most accessible glaciers in the world, and these are found in Glacier Country on the west coast of the South Island. Visible from miles away as a result of their dazzling shine, the glaciers are truly a spectacle in themselves, but if you want to get up extra close, you can choose to take a guided tour of either the Fox or Franz Josef glacier and climb the shining ice in true explorer fashion. You’ll be kitted out with all the necessary gear and be in the safe hands of professionals, but if climbing sounds a bit taxing, you could always splash out for a helicopter ride instead for a bird’s eye view. Whether you decide to get up close or simply marvel at it from your NZ campervan hire, make sure you check out this natural wonder during your trip. Not just a pretty sight to look at, the magnificent glaciers mentioned above have yet more to offer you as a visitor to New Zealand. Many years ago when they were moving through the South Island, they carved out some of the most spectacular landscapes on the planet, now known as Milford Sound and Doubtful Sound in the Fiordland National Park. With dramatic, towering valleys and waterfalls plunging down into the glassy water below, this area is a unique natural wonder that’s straight out of a Jurassic Park film set. The drive to get here is just as scenic, so allow some time as you cruise in your campervan to take it all in. And our New Zealand Highlights? Bay of Islands - perhaps New Zealand's top holiday destination, 230kms north of Auckland this is the home of over 140 islands rich in hidden bays, beaches and marine life including whales, dolphins and penguins. A must see. Franz Josef Glacier in the Westland National Park on the South Island's west coast giving you the experience of getting up close and personal to a glacier - splash out and take the helicopter tour. Milford Sound - lies at the top of the Fiordland National Park - wet it can be, stunning it is always. Milford Sound has few rivals in the world. With so much open space in New Zealand, you’ll never be short of places to park up your campervan or motorhome and spend the night. However, it’s normally more convenient (and legal) to head to a designated camping ground where you can find facilities like showers, electricity, and fuel. These sites can be found all over the country, and are also great for meeting fellow New Zealand campervan fans and exchanging travel tips. What’s more, with the stunning landscape right outside your doorstep, you’ll have a 5 star view for a fraction of the price. 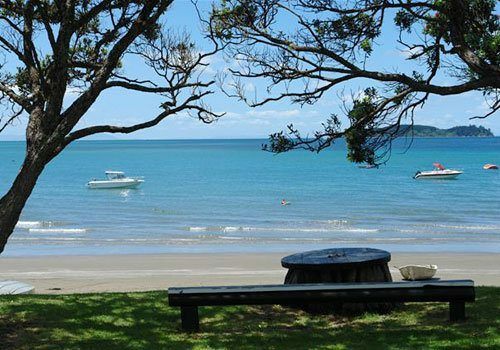 For road trips taking you around the Auckland area, a popular choice is Martin’s Bay Holiday Park. Located on the Matakana coast just 1.5 hours’ drive from Auckland Airport, you’re in a prime spot to explore the nearby beaches, islands, and Tawharanui Regional Park. The campground is particularly great if you’re travelling with family in tow, with kayaks and boats available for hire and a quiet, peaceful atmosphere. You’ll find all the kitchen facilities you need including BBQs, as well as laundry and electricity. With wineries, wildlife, and waterparks, there’s definitely something for everyone on the coast of the central North Island. For road trips around this scenic, laid back area, a convenient place to stop and refuel could be Hastings Holiday Park in Hawkes Bay. This park has everything you need for a holiday, whether you’re planning just a quick pit stop or a week-long break, with swimming pools, spas, and a kids playground on top of all your expected facilities. Another spot to check out on the North Island is Foxton Beach Holiday Park, this time in the lower west half of the island. This holiday park is also part of the Top 10 Holiday Parks group, which provide reliably good facilities in great locations. Less than two hours’ drive from Wellington, this park is located right next to Foxton beach, a great spot for water sports, biking, surfing, fishing, or hiking. Picton is the town that welcomes you from your ferry crossing from the North to the South Island, and also happens to be home to a park designed exclusively for campervans. Picton Holiday Park is just two minutes from the ferry terminal, making it very convenient for the end to a long journey. The park is family owned and operated, close to the town centre and complete with modern, clean facilities. Picton is a picturesque lively town with plenty of activities and restaurants if you’re stopping for a few days, and within only a short drive from some of New Zealand’s most beautiful wild scenery. As one of the most popular regions for campervan hire in New Zealand, it’s no surprise that Otago is host to plenty of facilities and sites to park up. A popular option in this area is Cromwell Holiday Park, a beautifully located, peaceful park surrounded by lakes and rivers. This park puts you in the perfect spot for exploring the nearby visitor hotspots of Queenstown, Wanaka, or the surrounding wineries. As for the park itself, you and your travelling companions will be kept busy and well catered for with a playground, TV lounge, spa facilities, and outdoor dining area. When it comes to picking your route for your New Zealand campervan adventure, the world really is your oyster. With such beautiful scenery from top to toe, just about anywhere you go will be rewarding. However, there’s a reason why certain routes are repeated time and time again by NZ travellers, and that’s because they feature some of the most outstanding scenery and most famous landmarks. 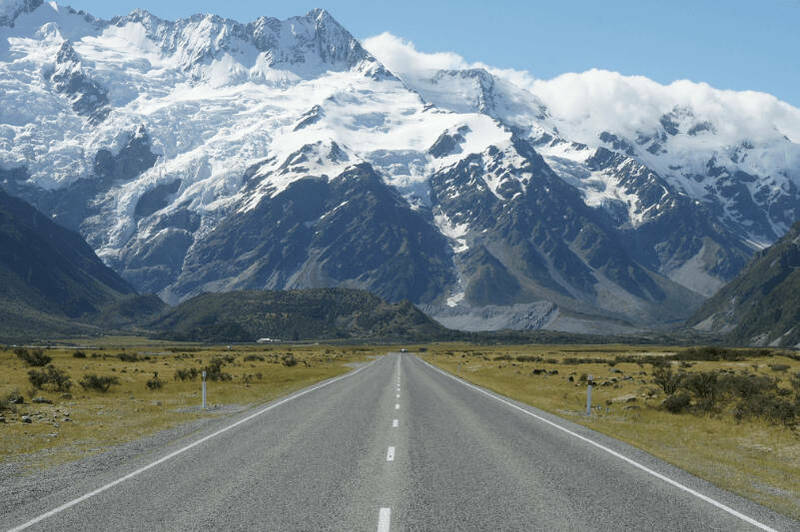 Here are just a few of these most loved driving routes to help you plan your ultimate road trip to New Zealand. Fly into Christchurch Airport, grab the keys to your NZ campervan hire, and prepare to have your socks knocked off by this dazzling road trip. The route from Christchurch to Queenstown can be easily done in one day if you’re in a hurry, but many people choose to take their time and stop off at some of the peaceful, quaint towns on the way between days of hiking or glacier spotting. Typically you would pass Lake Tekapo, Aoraki Mount Cook National Park, the Gibbston Valley, and sleepy Arrowtown before arriving in New Zealand’s famous adventure capital, Queenstown. This popular driving route gives you the chance to delve right into the world of the famous Lord of the Rings, taking in a number of the most memorable locations from the movies including Hobbiton, Mordor, and Bree. The route spans 740km and takes around 4 days to complete. The drive will take you past some of New Zealand’s most stunning natural features including lakes, hot geysers, and volcanoes, with stops at Waikato, Rotorua, Hamilton, Lake Taupo, Western Bays, and Foxton before finally arriving in Wellington. If you’re lucky enough to have a bit of time on your hands, make the most of it and explore the length of the country with a trip from Auckland to Glenorchy. This route can take around nine days, and offers a true taste of everything Kiwiland has to offer. You’ll visit some of the country’s biggest cities, cruise past lakes, waterfalls, mountains, beaches and glaciers, and end up in the beautiful town of Glenorchy in the picturesque Otago region. Cruising your campervan around New Zealand could easily be one of the most memorable experiences of your life. However, for first time campers, embarking on a holiday on wheels could seem like a slightly daunting or confusing concept. At DriveNow we’re here to help guide you through this journey and show you that campervanning is, in fact, one of the most enjoyable ways to travel, and all you need is a little preparation. Bear these tips in mind before heading off on your adventure and you’ll be sure to have a smooth, hassle free, and relaxing ride. New Zealand boasts a fantastically diverse climate, with hot, sunny summers (December to March) and cold, often snowy winters (June to September.) The country itself is just as diverse, with the far north offering subtropical weather during summers and the far south getting to as little as minus 10 degrees during winter. Travelling New Zealand during either of these seasons is just as much of an adventure, but bear in mind that cruising around the South Island in winter could involve driving in some tricky conditions, and the nights may be on the chilly side! Plenty of people cruise in campervans around New Zealand in winter, and DriveNow has plenty of vehicles that can help you navigate the roads. Make sure to check out the range of trusty 4X4’s and select additional accessories like snow chains if you are planning to explore snowy territories. As mentioned before, everyone would love the freedom to be able to simply park up their camper wherever they feel like it; especially if you find a spot that’s perfectly positioned next to a beautiful beach or sunrise. However, sometimes doing this can land you in trouble with the landowners,in trouble with the landowners,pers to ensure that you aren'. In NZ there are up wherever they feel like it. However sometimes so it’s always good to check first to make sure you have permission. In NZ there are plenty of options to make sure you aren’t stepping on anyone’s toes and can still enjoy the tranquillity you hope for with a campervan trip. Firstly, there are hundreds of areas dotted around the country which have been agreed as fine for campers to park up without any issues, so long as they abide by general rules of cleanliness and tidiness and leave no trace. Secondly, there are also Department of Conservation campsites in New Zealand, which come with no site manager and basic facilities and are located in some of the most scenic spots in the country. Lastly of course, there are the designated campgrounds and holiday parks mentioned above, all of which provide varying levels of facilities and entertainment, but can sometimes require booking. With all these options available you should have no trouble at all finding a spot to park your campervan rental in New Zealand, so there’s no excuse for making enemies with a grumpy farmer! If this is your first camping adventure, you may be baffled as to how you can possibly fit enough in your vehicle to keep you going for multiple weeks. However, you’ll soon realise you have nothing to worry about! All DriveNow’s vehicles come fully equipped with everything you need for eating, sleeping, and relaxing, so there’s no need to run around the shops gathering cutlery or bedding prior to your trip. However, as all vehicles and providers are slightly different, it’s a good idea to check out the listing of your chosen camper or motorhome to see what’s included and what you may have to bring along. DriveNow makes it quick and easy to arrange your campervan rental for New Zealand. Our experience working with the biggest and best brands in the market gives us a huge database of great makes, models, and sizes for you to pick and choose from, ensuring you can select a camper or motorhome hire in New Zealand that suits your needs and budget. In addition to awesome selection and convenience, you’ll also get the best pricing on the market. Our comparison service is impartial and unbiased, and the prices you see are always the best available, backed up by our lowest price guarantee. You also don’t have to worry about nasty hidden fees, leaving you to spend your money stocking up your new campervan with everything you need for an awesome holiday. What’s more, you’ll find campervans and motorhomes located all over NZ, so you’ll be sure to find one close to wherever you wish to start your adventure. All of these perks add up to easy and efficient NZ campervan or motorhome rental that will help you to get your travels started off on the right foot. Why Use DriveNow for Campervan Hire in New Zealand? Having a camper or motorhome hire in NZ is a memorable, laid back and fantastic way to explore the area. We’ve been helping Australians gain access to the campervans they need for more than a decade, and are ready and waiting to help you compare and find the right fit. How old must I be to hire a campervan in New Zealand? You must be over 21 to rent a campervan in New Zealand. Driver licenses must be full and unrestricted and been held for at least 12 months. What driving license do I require to drive in New Zealand? You can drive in New Zealand using your own driving license if it in English or has an English translation. Otherwise you will require an international driving permit which will be readily available in your country. All designated drivers need to have their driving license details recorded when picking the vehicle up. Are there minimal rental period when renting a Campervan in New Zealand? Yes. The standard minimum rental period is generally 5 days however many companies impose a 10 day minimum at peak time (eg over Christmas) and some do the same if you plan on using the Inter-Island Ferry to drop off your vehicle on a different island. Can I take a Campervan on the Inter-Island Ferry? Yes. Rental companies permit campervans to be taken on the inter-Island ferry service between Wellington and New Zealand. See our Inter-island Ferry campervan rental info page for further information. Can I take pick up and drop off my Campervan at different locations? Yes. One way Campervan rentals are very popular in New Zealand. Some providers do charge a one way fee particularly if dropping off on a different island. Any applicable fees will be highlighted with your booking. In New Zealand highways and freeways are limited to 100kmh and urban traffic to 50kmh. The New Zealand Government charges a levy for all road users. For regular petrol engines this is included in the price of fuel. For renters of diesel vehicles this charge is payable when dropping off your vehicle and is based on the distance traveled. Some rental companies include this charge with their daily rate. Is it compulsory to wear a seat-belt in New Zealand? Children under the age of 14 are not allowed to travel in the front seat of any vehicle. In the rear seats all children under 5 must be in a child seat. Children 5-7 must use a child restraint if available and children 8-14 must use a safety belt. Hiring a campervan can be an exciting way of exploring New Zealand with the whole family, especially for your kids – imagine the delight on their faces at the prospect of living in a house with wheels! If it's your first time travelling in a Campervan in New Zealand or anywhere for that matter, here are some things to keep in mind. The post How to Make the Most of your New Zealand Campervan Rental appeared first on DriveNow Blog. Freedom camping is a hot topic for New Zealand tourism, and a thoughtful visitor will opt to pay the low fee at a camp ground instead of undertaking this practice with their New Zealand campervan rental. The post What is freedom camping? appeared first on DriveNow Blog.